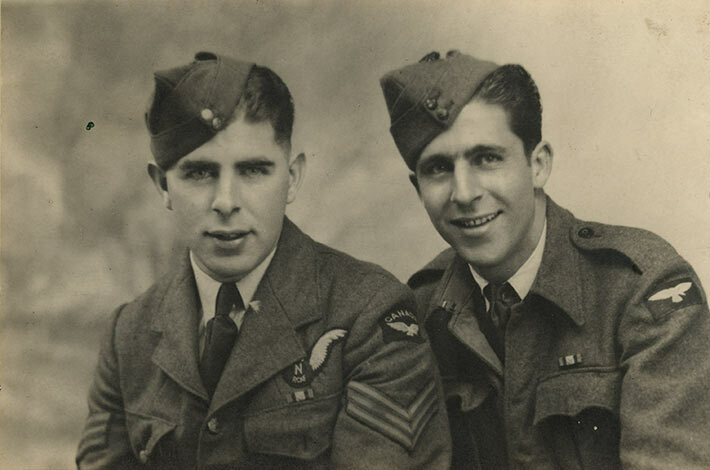 Photograph of Enrico & Olindo Sauro, in military uniform, Toronto, ON. Rev. Libero Sauro was arrested on September 7, 1940 and held at Don Jail before being transferred to Petawawa Internment Camp. His arrest was due to his membership with the Order Sons of Italy (OSI); he held the Office of Grand Administrative Secretary. Correspondence indicates that both he and his wife believed an unnamed community informant was also responsible. Although interned, Sauro's five eldest sons served in the Canadian Army and Canadian Air Force. Enrico and Olindo were both airmen and served in the air force.